Our Undergound Dining tickets will go on sale the Friday of the May long weekend when we open for the season. We will also have tickets available for all of our Cavestock-Undergound Concert Series however tickets are selling fast! Join us for the first of our four Bonnechere Museum Fossil Hunts. 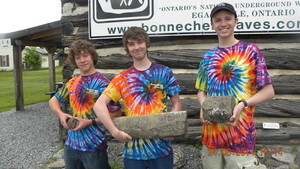 All Fossil Hunts begin at 10 AM at the Bonnechere Museum in beautiful downtown Eganville and last approximately 2 hours. Age 12 to adult $6.00, children 4 to 11 $3.00, 3 and under free. No reservations necessary! Join an enthusiastic group of paddles and some Fiddlers for a trip up and down the Bonnechere from just below Eganville to the fourth Chute (Bonnechere Caves). The Itinerary: Please read carefully! Due to low water levels which affects the rapids of the Bonnechere however not the flat water sections we will not be busing up to the Kilbys' home for the put in. The paddle will start and finish here at the Fourth Chute (Bonnechere Caves). Start is at 3 PM and we will finish approximately 4:45 PM. 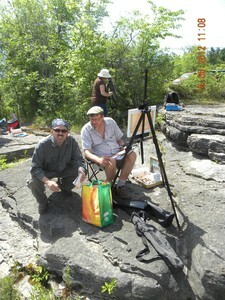 1:00 to 2:30 – Registration in the Bonnechere Caves picnic area. $15 per person. This includes admission to the Heritage Radio Paddle and Fiddle BBQ and Open Mic. 3:00 – 4:30 Paddle and Fiddlin’ up and down the Bonnechere. 5:00 – 8:00 – Heritage Radio Paddle and Fiddle BBQ and Music Open Mic. Note: so as not to create too much congestion in the Bonnechere Caves parking lot some folks may be directed to park in the Cavanagh Quarry just across the river from the caves. Join the paddlers and local Ottawa Valley musicians along the shores of the Bonnechere River for some good tunes and fellowship. This is an open mic and nobody will be turned away. As we at the caves love fiddle music people should be made aware this event will be more then fiddling! Admission - $5 - all proceeds from this event go to the Bonnechere River Watershed Project. Free admission with registration in the Paddle and Fiddle. Join us for the second of our four Bonnechere Museum Fossil Hunts. All Fossil Hunts begin at 10 AM at the Bonnechere Museum in beautiful downtown Eganville and last approximately 2 hours. Join us for our first of three Underground Concerts we are calling “Cavestock-Underground Concert Series”. A guided tour underground in the afternoon. A $20 gift certificate for supper at the Rio Tap and Grill in Eganville. An underground concert at 7 PM. Numbers of seats are limited due to space available in the caves. Reserve early! Join us for the third of our four Bonnechere Museum Fossil Hunts. All Fossil Hunts begin at 10 AM at the Bonnechere Museum in beautiful downtown Eganville and last approximately 2 hours. 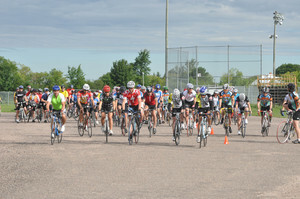 The Tour de Bonnechere (Eganville, Ontario, Canada) is a timed self supported road ride that celebrates cycling in the beautiful Ottawa Valley. Challenge yourself to ride the short course (60k) in 2.5 hours or the long one (100k) in 3.5. This is not a race! Enjoy riding with like minded people at whatever pace you choose. 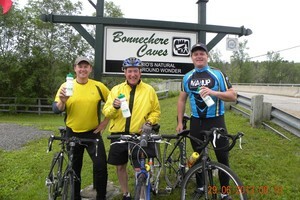 A scenic family ride (18k) makes its way to Bonnechere Caves and back. Join us for our famous pot-luck BBQ and party afterwards! All proceeds support local charities. Join us for our third of three Underground Concerts we are calling “Cavestock-Underground Concert Series”. Tip, taxes, 4 course meal, bottle of wine per couple, guided tour underground that afternoon, piano and guitar music in a unique setting. These evenings are now sold out. We suggest you look further on our special events section and perhaps take in one of our music nights we do the last three Thursdays in August! Call Chris @ 613-628-2283 Reservations by phone only! PAINT THE WATERFALL ANY DAY YOU CARE TO! Grab your easel and stool and paints and paint. The Fourth Chute Falls are a favorite for artists and photographers alike! Every Tuesday our staff will be proudly wearing our Tie Dye T’s from Rrijoice Tie Dyes “happy clothes for happy people”. It is our way of honoring the “back to the landers” who came to the Ottawa Valley in the 60’s and 70’s and stayed and in that time have added so richly to the arts and culture of our valley lives. Anyone who wears an article of Tie Dye will get $1 off their admission. BIKE FROM OUR PARKING LOT ANYTIME YOU FEEL LIKE IT! Everyone is Welcome! The Bonnechere Caves parking lot is right in the middle of some of the safest most scenic road biking in the Ottawa Valley. Talk with our staff at the ticket kiosk about routes between 10k and 100+k. Routes will take you through the townships of North Algona-Wilberforce, Adamaston-Bromley and Bonnechere Valley. The most challenging ride in the Ottawa Valley!